What was in Citrus Lane March 2014? This is our second Citrus Lane box and I was very excited to receive it in the mail. One of the best concepts of this service is receiving special surprise gifts every month. Which I love! 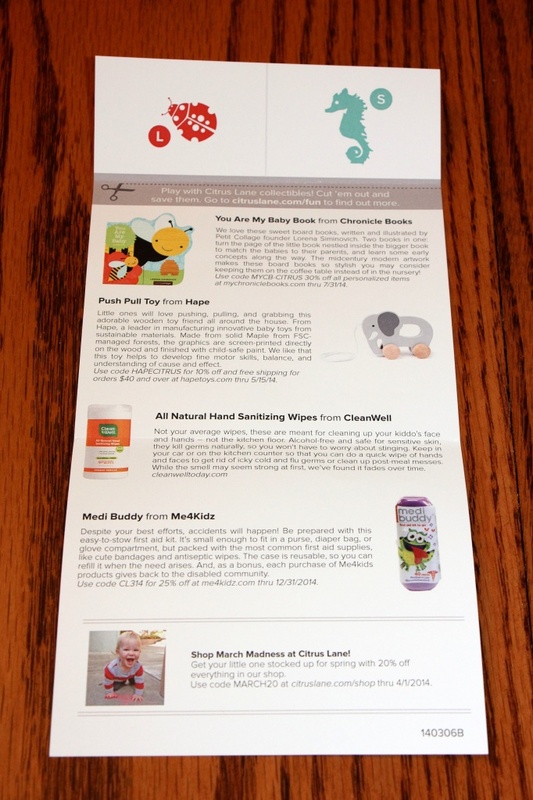 I did quite a bit of research via fellow mommy blogs before deciding on Citrus Lane. I would suggest that you do your due diligence between all the subscription box offerings before shelling out the cash. Or take advantage of a discounted first box to see if you love it as much as we do! Check out the promo discount opportunity at the bottom of this post to get started with Citrus Lane! 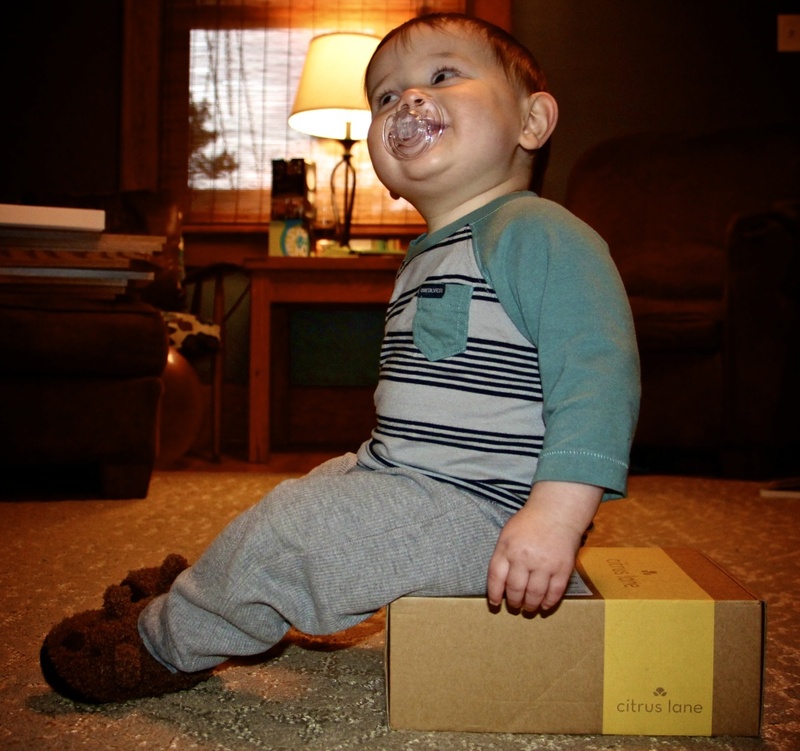 Citrus Lane is a monthly subscription service that sends a box of (four or more) boutique kid and mom-related items from ages 0-5. 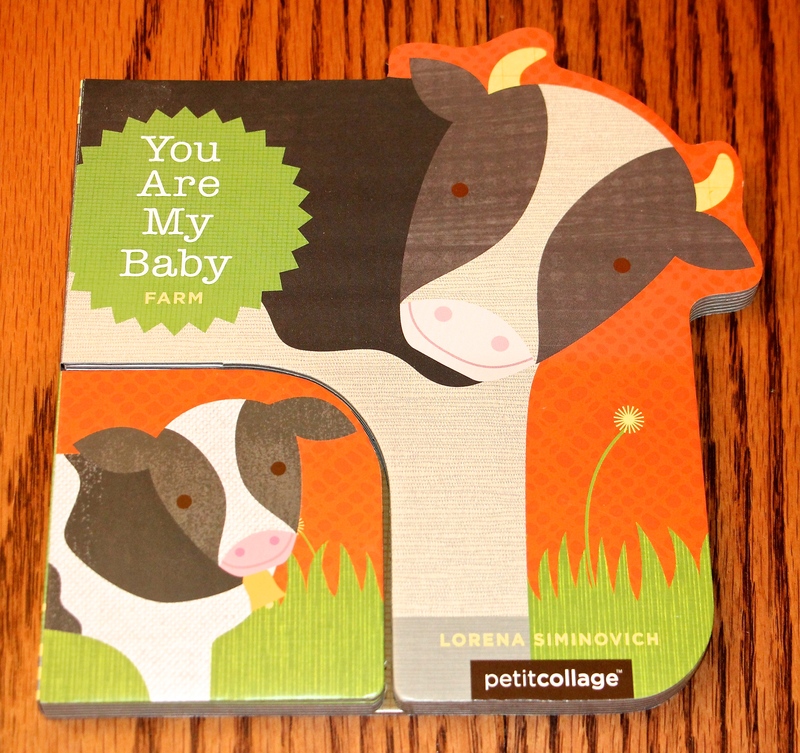 Each box is tailored to the age of your child each month. 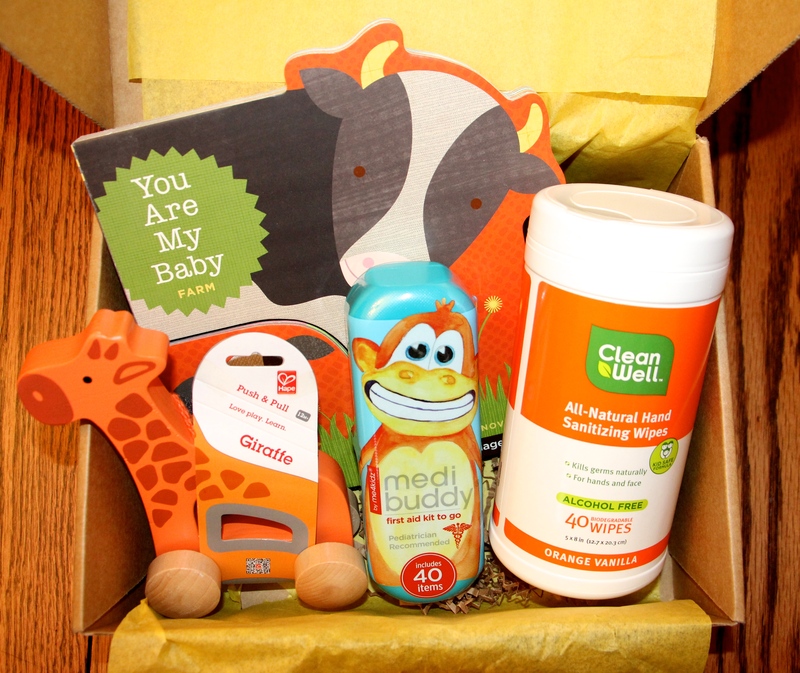 They partner with the newest and best brands to surprise your family with a unique box of the best products! *My price comparisons are (mostly) based on current Amazon.com prices because that is where we primarily shop, feel free to compare to wherever you shop! Received the email that our box shipped 3/15/14 and we received it today, 3/18/14. As always, I love that they send a personal note detailing everything in the box AND they include discount codes for the brands in the box. Fabulous perk! № 2. 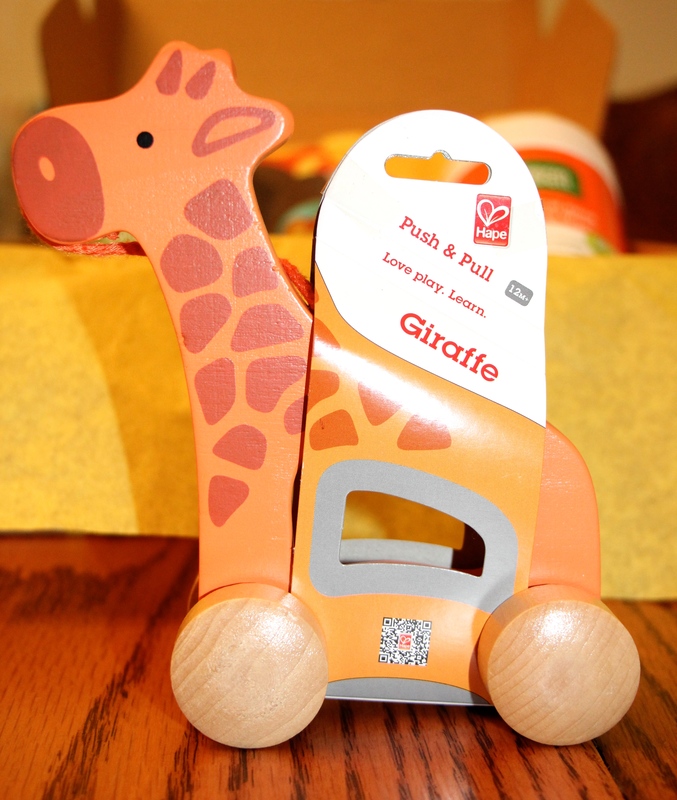 Hape Push Pull Toy (Giraffe) ($12.94) – 12 Months+. Citrus Lane mixed it up a bit and allowed for a little personalization with this super adorable toy. CL contacted parents before the boxes came and allowed them to choose from four push pull toys (elephant, alligator, giraffe and zebra). At first I was a little surprised how tiny this little guy is (about 6″ tall) – but then I realized it will be awesome for taking with us in the diaper bag. A travel push pull toy is just a great idea all around. I love this so much we will be buying the elephant as well. № 3. 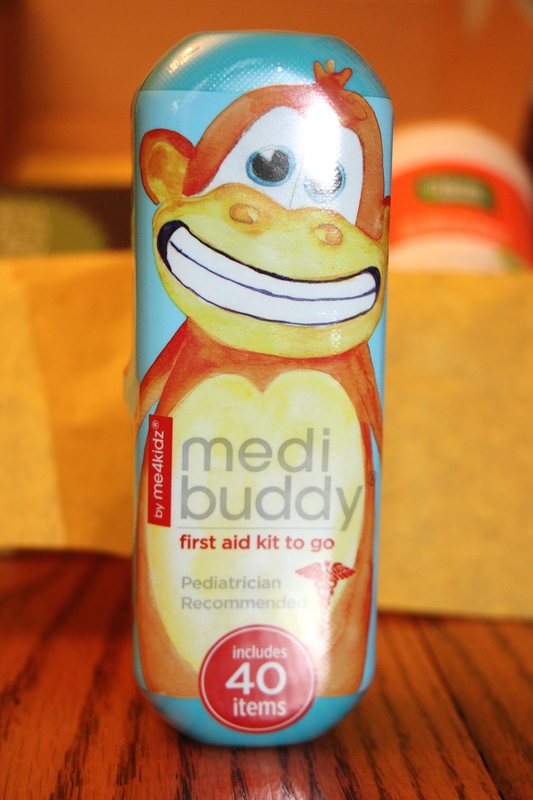 Me4Kidz Medi Buddy ($5.15). New brand alert for mommy! This is just cute, includes 40 items and is perfect for portable first-aid in the car, purse, backpack, stroller, etc. Comes with 15 kid-friendly bandages, 1 large bandage, 2 antibiotic ointments, 5 sting-free antiseptic wipes, 4 2″x2″ gauze pads, 12 fun stickers and a refillable carry case. All products are latex free. № 4. 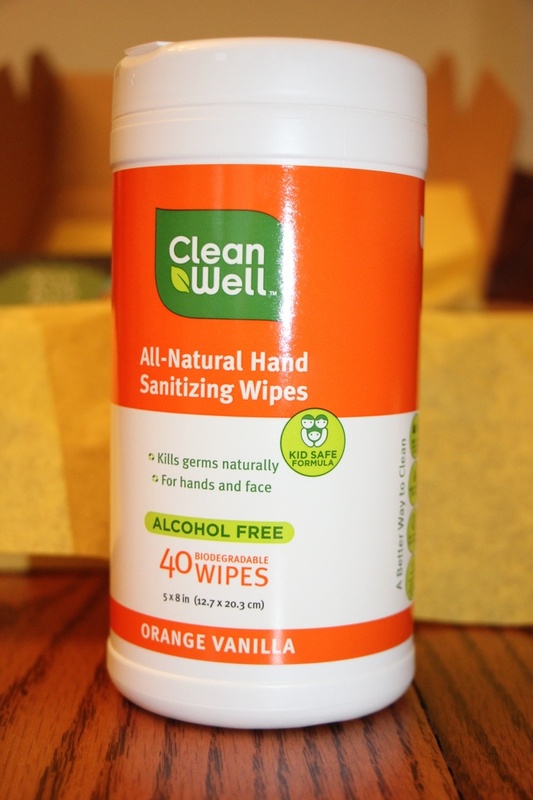 CleanWell All-Natural Hand Sanitizing Wipes ($5.06) – 40-ct. Orange vanilla scent. I was a little skeptical, but it is a really nice fresh smell! 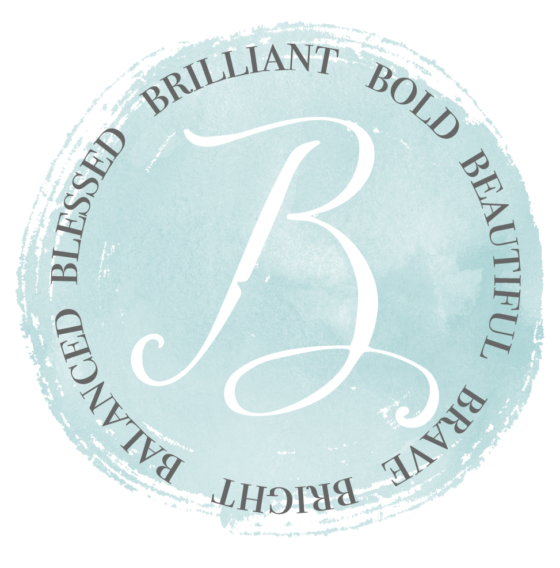 Another new brand alert! Comes in a petite container (6.5″ tall, 10.5″ around), great size to stash in the car. Love that it is a kid-safe formula. In all, I received four items with a total value of $31.07. I purchased the annual subscription, so I paid approximately $18.17 per box. Overall, very pleased with my second box and experience with Citrus Lane. Was introduced to two brand spankin’ new brands, looking forward to trying them out! The pull toy was the clear winner in this box, just too cute. We will use every single item in the box, so no loss there! If you are interested in trying out Citrus Lane, sign up here for 50% off your first box via my referral link! I really love this perk for new users. If you are on the fence, it is a great way to test drive this subscription box service without paying a premium price. Have you ever used Citrus Lane? Do you love it or dislike it? What did you get in your box this month?